Marshmellow (now Mia), is a beautiful, beginner-rated rare female gingerbread girl who was surrendered with her furry friends, George, Bam and Sparky due to their owner “having too many pets.” Fortunately, they were all saved. George, Bam and Marshmellow ended up at the same wonderful foster home. 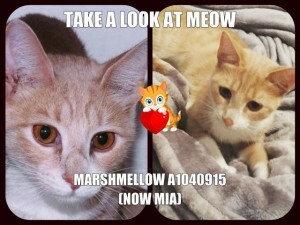 Marshmellow was the first to be adopted. Here is a picture of this precious pet, now named Mia, in her new home.